The 1525 Combination Padlock - The "World's Best Selling Combinaton Lock!" All No. 1525 padlocks come with control charts and have the additional feature of Key Control (Key Override) for supervisory access. Control Keys are sold separately (See "Companion Items" below). We do offer Bulk Discounts (see Bulk Discount Pricing below), and will accept Purchase Orders from public schools and institutions. You can fax all PO's to us at 301-948-1029. - Combination: Combination Alike (1525KA). 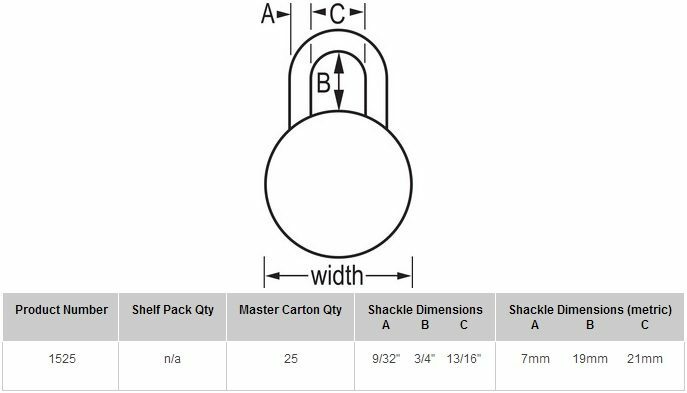 - Special Ordering: See below for Special Order information (i.e., ordering padlocks matched to existing control number). - Delivery: The Master Lock 1525KA Combination Padlock is factory-ordered, please allow 8-10 working days' lead time. All 1525 Padlocks come with control charts and have the additional feature of Key Control (Key Override) for supervisory access. - Combination Alike - order multiple locks with the same combination. Key Control: The 1525 Padlock has an additional feature of Key Control for supervisory access (Control Keys are sold separate, see "Companion Items" above). Purchase Orders: We do accept Purchase Orders from public schools, universities and institutions. You can e-mail all PO's to Sales@TaylorSecurity.com or fax to us at 301-948-1029. Special Ordering: If you require the No. 1525 Padlock matched to a specific serial number or control key number please leave a note in the Comments Box upon checkout (you can also immediately reply to the Confirmation E-mail with special order instructions).